Munno on his wedding with Irene Acan. OMORO. A United Kingdom-based nephew of UPDF Reserve Forces commander Maj Gen Otema Awany is threatening his clan members and relatives to vacate a customary land. On March 16 Geoffrey Munnu through his lawyers Kunihira and Co Advocates wrote letters to the families in Alokolum notifying them that he is the rightful owner of the said land and that they are carrying out all activities on the land illegally. Munno ordered the families to vacate the said land or face criminal trespass charges. The land in contention is about 47.7 acres (17.7 hectares) in Guweno Too Ward Village, Alokolum Parish in Omoro District. However, the families on the land allege that Munnu illegally processed letters of administration for his father Alfred Kinyera Okee without consulting the other family members. They accuse Munnu of using his wife as part of the signatory for the family consent letters. 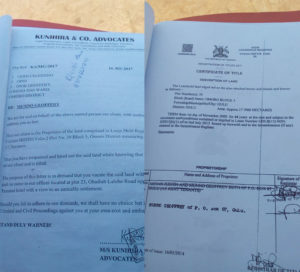 Munnu’s wife, Irene Acan Susan, is accused of using the name of Munnu’s sister Judith Acan and mother Christine Lanyero Awany in 2005 to process the letters of administration with which they used to acquire a certificate of land title and lease offer for 44 years. The land title was first acquired jointly with Judith Acan, who was being impersonated by Munnu’s wife Irene Acan, before Munnu moved to take sole possession of it. In the early 1990s, Munno’s paternal uncles Onari Latigo and Balicharo Opio agreed that in order to safeguard the land from the expansion of the Catholic Missionaries in the area, they would lease the land but in the name of their grandfather Luis Labeja. Munnu’s father Kinyera — now deceased — was given the responsibility of registering the land. And all was well for decades to follow. Emmanuel Ocen, one of the family members who heads the group that is countering Munnu’s claims, said the land in contention is a customary property occupied by more than 100 family members and cannot be individually owned. “Munnu has made life very hard for those living on the land because he is continuously using soldiers and police to harass them,” Ocen said. Judith Acan whose identity Munnu’s wife is alleged to have used to fraudulently. Ocen accused Munnu’s maternal relatives of orchestrating the fraud and subsequent harassment of the families living on the land, arguing that when Ocen filed a civil suit against Munnu before the High Court seeking nullification of the letters of administration and land title, all witnesses came from the side of his mother. He said the witnesses included Ojok Awany, father of Gen Otema Awany; and Delfina Awany, mother of Munnu’s mother Christine Lanyero Awany. “Munnu grew up with his uncles and it’s a surprise that the mother is back into the picture to claim ownership of land at a home she left in early 1980s,” Ocen said. The controversial land title and notice of eviction. Benson Okello, Munnu’s paternal cousin brother, said the land doesn’t belong to only eight children of Luis Labeja but to all his other children who belonged to his three wives. Okello said the land was given to their father Labeja as a reward from his in laws because one of his wives hails from the same area. “Munnu should understand that he will get disappointed by the family of Awany. He should come down here and get together with his brothers so that we continue living together peacefully,” Okello counselled. He said it was disappointing that Munnu was adopting a hard stance on a land that he should be sharing with the rest of the family. “I am very disappointed in Munnu. He should come and apologise but if he refuses to do so, we will use the law to sort things out,” Okello said. In a voice recording, Munnu claimed that he would easily obtain letters of eviction, stating that only himself and his father’s children should remain on the land in Alokolum.